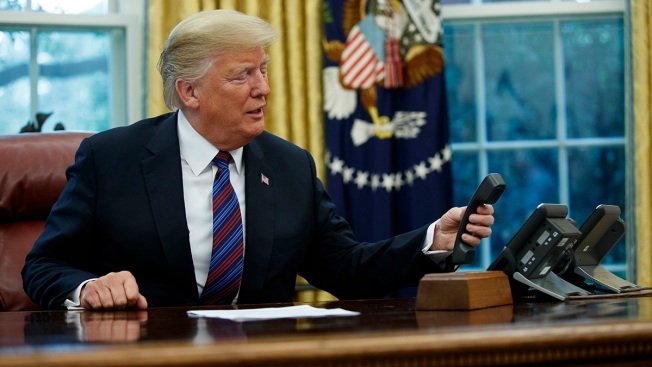 President Donald Trump hangs up after talking with Mexican President Enrique Peña Nieto on the phone in the Oval Office of the White House, Aug. 27, 2018, in Washington. Although Peña Nieto made clear in the call that he wants Canada to be incorporated into the deal, Trump said that when it comes to Canada, “We can have a separate deal or we can put it into this deal.” Alternatively, Trump said that the U.S. might impose tariffs on U.S. imports of cars from Canada. Trump, Aug. 27: We made the deal with Mexico. And I think it’s a very — deal. We’re starting negotiations with Canada, pretty much immediately. I can’t tell you where those negotiations are going. It’s going to be a — it’s a smaller segment, as you know. Mexico is a very large trading partner. But we’ve now concluded our deal and it’s being finalized. We reached out to the White House and the Office of the U.S. Trade Representative for clarification of the president’s remark about the Canadian deal being a “smaller segment.” We did not get a response. In context, the president appears to be saying that Mexico is a larger trading partner with the U.S. than Canada. And that’s not the case. According to the U.S. Census Bureau, Canada and Mexico are the second and third largest trading partners for the U.S., in that order. 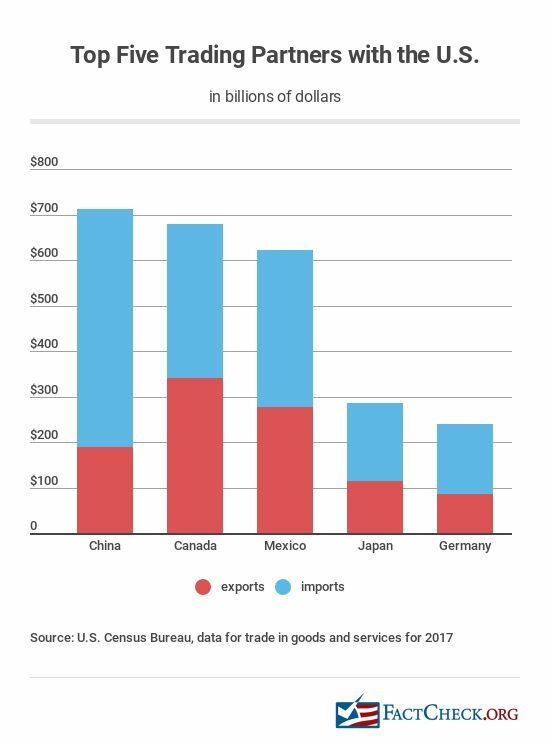 In 2017, the U.S. did nearly $680 billion worth of trade in goods and services with Canada, the Census Bureau reports — $341.3 billion in exports and $338.5 in imports. That was about $57.7 billion more in trade with Canada than with Mexico. The U.S. did $622.1 billion worth of trade with Mexico — $276.7 billion in exports and $345.4 billion in imports. China was tops in combined trade with the U.S. at $711.7 billion. We will update this item if we hear back from the White House.